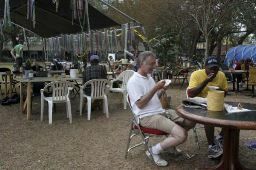 Carl Mack, left, and Ty Johnson enjoy chicken dumplings with vegetables at the Welcome Home New Orleans Community Restaurant at Washington Square Park. The so-called "hippie park" is attracting an eclectic crowd which some officials are starting to object to. NEW ORLEANS -- The Faubourg Marigny just outside the French Quarter is one of the few areas of New Orleans that Hurricane Katrina did not flood. But now, a small city-owned park inside the area is awash in controversy. Washington Square -- bordered by Elysian Fields Avenue and Royal, Dauphine and Frenchmen streets -- is now home to a makeshift medical tent run by a group called Barefoot Doctors' Academy and a soup kitchen. The medical help, generally basic first aid, and three meals a day are free. The wrought iron-lined square has attracted an eclectic group, including the homeless and vagrants, and has earned the nickname "hippie park." Joe Braun, a musician who lives in the nearby Bywater area and performs at The Spotted Cat lounge on Frenchmen not far from the square, doesn't care for the park's new moniker. "There is a fear and prejudice out there for hippies that started in the '60s. It wasn't rational then and it isn't rational now," Braun, who helped organize the "Welcome Home New Orleans Community Kitchen" in the square, said this week. Connie Walker lives on Dauphine near the public park and says the medical facility and soup kitchen have worn out their welcome. "They need to move their free party to somewhere else," she said. "Our community doesn't even walk into the park and use it. They are belligerent and hostile, and they smell." New Orleans City Councilwoman Jacquelyn Clarkson, whose district includes the Faubourg Marigny, said the neighborhood seems to be evenly split on the situation in the park. "The city, the administration, approved it as a medical site," she said. "I wasn't asked. It was all done by the administration, which they have the prerogative to do." Clarkson said the medical help and food distribution have raised public health concerns. "So I agree with closing it down," she said. Braun and Patty Peebles, a registered nurse from Austin, Texas, who is helping to staff the medical tent, said the city's Police Department and Parks Commission have threatened to shut them down, but it hasn't happened yet. Clarkson contends the neighborhood doesn't need the medical and food services, but Peebles says some residents just a few blocks away still have no electricity and shelters are few and far between. "There are no shelters. People are forced to be homeless," Peebles said. "We're not attracting people. The people we're seeing are here." Braun, who said the medical and food staffs have cleaned up hurricane debris from the park, said criticism of those services is "misguided." "I think they (critics) should be ashamed of themselves," he said. "This is a time for all people of New Orleans to stand together." Clarkson said another liability concern for the city is that "we can't document that the medical help is credentialized." Sharon Foell, who describes herself as a medicinal hydration technologist, readily admits she is not medically accredited, but she said accredited medical personnel are on site at all times. "I can fix a really mean boo-boo," she quipped. Braun said the soup kitchen, which operates with donated food, does not pose a health risk. "We are extremely mindful of sanitation issues here," he said. "Health is first and foremost on our minds." Peebles said National Guard troops have eaten at the square, and Braun said firefighters have dropped off food at the park. Ken Ferdinand, owner of Cafe Rose Nicaud on Frenchmen just across the street from the square, said the park is public green space and should not be a food distribution site. "We're not opposed to them as people. We're opposed to them as policy," Ferdinand said, adding that he has been allowing the square's new residents to use his cafe restrooms. Ferdinand said the "peace and tranquility" of the only green space in the neighborhood have been taken away. "I don't know how the city can allow it," he said, adding that the medical and food services should be moved to City Park, where the need is great. Braun claims the square was "not a very heavily utilized park" pre-Katrina. Deborah Oppenheim lives on Frenchmen and says the free medical aid and food being distributed at the square represents the true "spirit of giving." "There's always going to be disgruntled people," she said, adding that those people need to keep in mind the magnitude of the hurricane crisis.